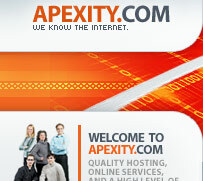 Apexity offers more ways to save you money for your online projects. Our monthly maintenance plans can help you maintain or grow your website. that require external, or additional fees. Standard labor rate is $75/hour. View the chart below to see how you much can save. Each Block is equal to one hour of labor, with a 30 minute minimum per update. Additional hours will be billed at your plan rate, according to the usage chart above. For questions or registration, email support@apexity.com or call us at (877) 273-9489.